The prostate is an exocrine gland, whose secretion helps the survival and motility of sperms. It is also a major target for oncogenic transformation, as prostate cancer is the second leading cause of cancer death in men in America. The anatomy of the prostate organ is relatively simple. It is composed of multiple tubule-like prostatic ducts that contain epithelial and stromal compartments. 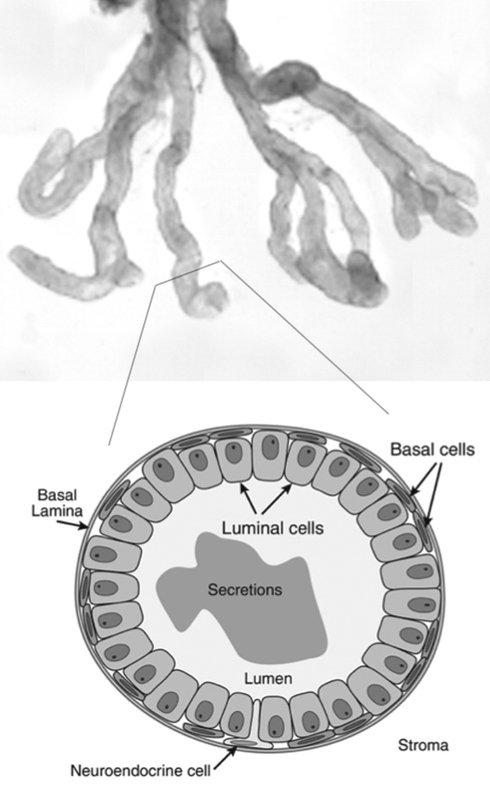 The prostate epithelium contains just two layers of cells, namely, luminal cells that are responsible for secretion into the lumen, and basal cells near the basement membrane. Rare neuroendocrine cells are also interspersed in the epithelium. The stromal compartment contains fibroblasts, muscle cells, and cells of the hematopoietic system. Almost all prostate cancer cases arise from the epithelium, but epithelial-stromal interactions play a critical role in both organ development and prostate cancer progression. What is the cell lineage relationship in the prostate? How do cross-talks among different cell populations regulate prostate normal homeostasis and disease progression? Having extensive research experience in developmental biology, our team is in a unique position to tackle these questions by doing experiments primarily in vivo. We have previously identified both basal and luminal cells as cells of origin for prostate cancer, and associated luminal-origin tumors with faster progression. Currently, we are employing novel techniques such as genetic lineage tracing, organoid culture, and CRISPR genome-editing to investigate the following major research topics. 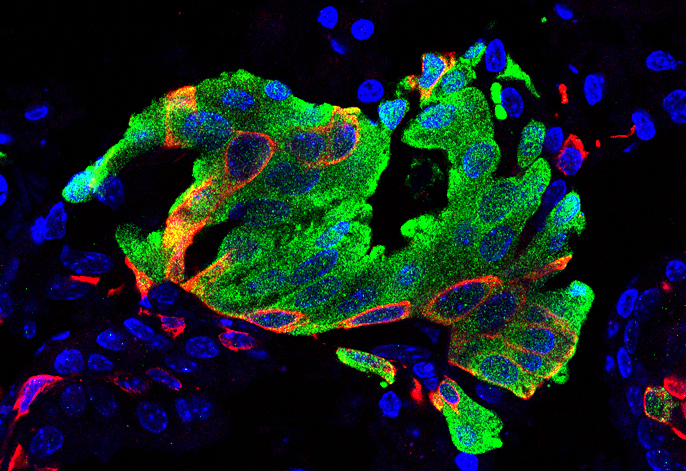 Using genetic mouse models, previous research from our team and other labs showed that basal cells behave as adult stem cells to produce luminal cells during prostate organogenesis. However, in the mature prostate, basal stem cell activities are significantly restricted, and basal-to-luminal cell differentiation becomes rare. Interestingly, basal-to-luminal differentiation is greatly enhanced under oncogenic or inflammatory conditions. This phenomenon may explain the predominant luminal cell phenotypes (and lack of basal cells) observed in human prostate cancer. Are tumorigenic basal cells in a state similar to that of the young adult basal stem cells? Supported by NIH, we are dissecting the internal and extrinsic signaling pathways that regulate the stem cell plasticity of prostate basal cells. The male hormone androgen regulates numerous aspects of prostate physiology and cancer progression through the transcription factor androgen receptor (AR). Despite the use of androgen-deprivation therapy (ADT) in the clinics, prostate cancer almost always relapse after this treatment. This can be partially attributed to the distinct roles of AR in different cell types of the organ. For instance, whether AR in stromal cells is tumor-suppressing or -promoting is still under debate. Recently, our lab discovered cell-type-specific roles of AR in the prostate epithelium. In particular, AR was found to be cell-autonomously required for stem cell activities of basal stem cells as well as a type of luminal stem cell called CARNs. 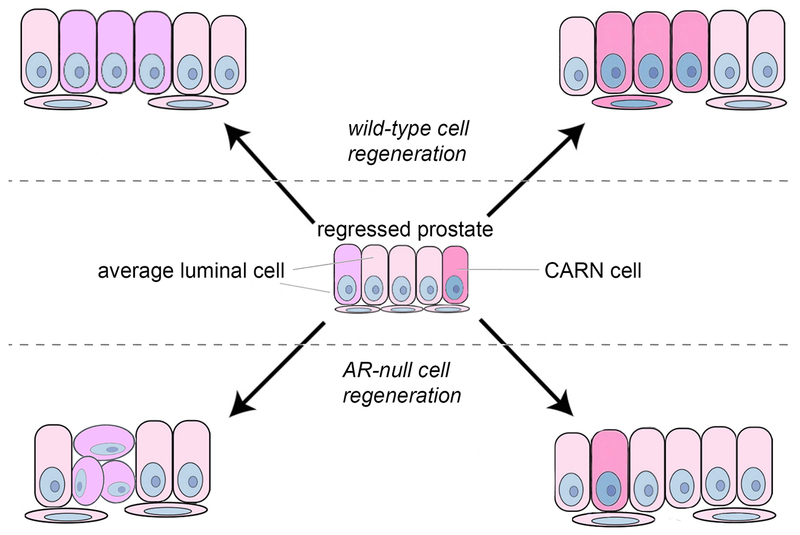 CARNs are distinguished by the expression of the gene Nkx3.1 in luminal cells after androgen deprivation. Being a transcriptional target gene of AR, Nkx3.1 encodes a key regulator of prostate cell fate specification and tumor suppressor. Currently, we are investigating the molecular mechanisms by which AR orchestrate different cell behaviors in prostate homeostasis and how Nkx3.1 is transcriptionally regulated.